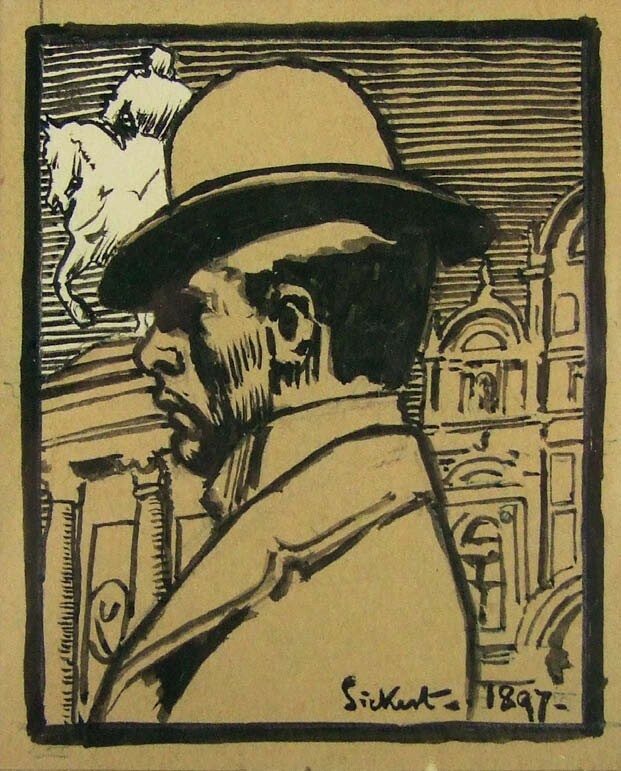 The setting for this near-monochrome self-portrait, below, by Walter Sickert (1860-1942) is the Campo SS Giovanni e Paolo in Venice and shows the equestrian statue of Bartolomeo Colleoni and the Scuola Grande di San Marco. Self-portrait by Walter Sickert - £4500 at George Kidner. Like so many other artists, Sickert was drawn to Venice, painting the city’s much-loved landmarks time and again during his frequent trips towards the end of the 19th century. The 4½ x 3¾in (11.5 x 9.5cm) pen, ink and wash, signed and dated 1897, improved upon a £2000-3000 guide to sell for £4500 at George Kidner’s (21% buyer’s premium) July 26 sale in Lymington, Hampshire. A similar but larger self-portrait of the artist in profile from the same date sold at Christie’s London in 1998 for £6900. It was published in The Year’s Art in 1898, an English magazine illustrating events in the art world that had occurred the previous year.